The Temple Daily Telegram via AP/Bell County Sheriff's Dept. Nidal Hasan, accused in the Nov. 2009 Fort Hood shootings that killed 13 people, undated. 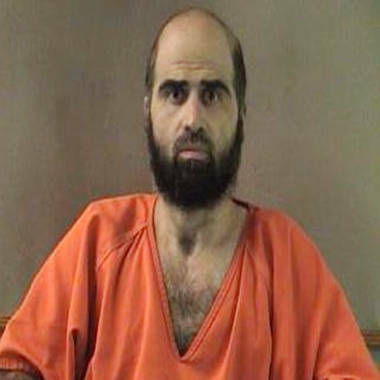 Maj. Nidal Hasan, the Army psychiatrist accused of carrying out the November 2009 shooting spree at Fort Hood in Texas, sought to plead guilty Wednesday to 13 counts of premeditated murder but the judge said he could not accept the plea, the Temple Daily Telegram reported. Under military law, Hasan is not allowed to plead guilty because the premeditated murder charges carry death as the maximum sentence and the government is pursuing the death penalty in Hasan's case. The Telegram, providing live updates from the courtroom, reported that military judge Col. Gregory Gross said Hasan wanted to plead guilty to the capital counts. (Gross) "explained he is prohibited from accepting such a plea," according to Telegram reporter Paul Romer. "The motion apparently indicated Hasan wished to plead guilty to take responsibility for his actions." "There is no right to plead guilty...The accused could still take responsibility for his actions — Judge Gross." "Judge Gross said he would enter not guilty pleas in behalf of Hasan, if necessary." "Hasan apparently claimed not being allowed to plead guilty violated his religious beliefs, which Gross disagreed with." Military law would allow Hasan to plead guilty to lesser murder charges that do not carry the death penalty, the AP reported. But that scenario was unlikely because efforts to reach a plea deal failed over a year ago, it reported, citing John Galligan, a civilian attorney who represented Hasan before leaving the defense team in 2011. It's been nearly three years since Hasan allegedly opened fire on personnel at a medical facility on the Texas Army post, leaving 13 dead and 32 wounded. The trial for Hasan — scheduled to start on Monday — was put on hold because of another dispute in the military court. Hasan has appealed the court's orders to shave his face to comply with military law, saying his beard is a requirement of his Muslim faith, the Associated Press reported. On Tuesday, Gross also denied a motion by the defense to exclude testimony by Evan Kohlman, a specialist on "homegrown terrorism," who was on the list of prosecution witnesses. On Wednesday, for the fifth time, the judge started the hearing with a contempt charge against Hasan and fined him $1,000, for showing up unshaven.